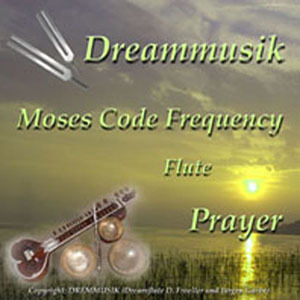 Dreamflute Dorothée Fröller's composition is based on the Moses Code Frequency Tuning Forks by Jonathan Goldman. Inspired by James Twyman´s book The Moses Code I bought the two Moses Code Frequency Tuning Forks on the site of Jonathan Goldman. The book tells us about the name of God "I AM THAT I AM" being given to Moses by the Burning Dorn Bush. We learn how to use the name of God in our lives to find inner peace and the Onness with the Divine. With numerology Jonathan Goldman has calculated the Hebrew letters of the name of God "EHYEH ASHER EHYEH" and put these frequencies into sound with his Moses Code Frequency Tuning Forks. EHYEH has a sound between "E" and "F" (a high E or a low F), ASHER sounds somewhere between "B" and "C" (a low C or a high B). Both tones sounding together as a 4th being the sound of the Name of the Divine. The sound of the two tuning forks is connecting us with the Divine part within ourselves, healing and cleaning our soul and our spirit. On our CD the sound of the Moses Code Frequency Tuning Forks is the basis of the composition being heard throughout all pieces. We tuned our instruments to this frequency having composed 7 musical prayers which you can meditate while listening to the music - and very important! - FEEL the mantras while listening. While listening to the music meditate on the mantra "I AM PEACE". Feel as much as you can the energy of peace. You may use this prayer for certain issues you want to solve, to find peace with that problem. Most important is to FEEL the peace. When we are in peace inside, everything around us is also in peace. This is the reason why I chose this prayer to be the first one. Feel that you are the source of your own healing. Go and visit the place inside of yourself where everything is whole and in balance, come home to your Divine Self. Feel the deep gratefulness for all the gifts you have in your life. BE this gratefulness. Feel the joy, the inner joy within yourself. BE this joy. Feel the abundance that origins from inside of yourself. Feel how this joy is filling yourself completely and how it is flowing out of you into the world. BE this abundance. Feel the unconditional love of God within your heart. Feel unconditionally loved by God. BE this unconditional love that fully fills you. Feel during the meditation that you are connecting with the Divine part within yourself and that you ARE this Divine Being. Because the code of the name of God is written in our DNA, our cells are resonating with the sound of this music. This is harmonizing body, spirit and soul producing positive energy in our whole system. If we enter completely into the sound of this music, blockages can be released. This music is wonderful to be used as background music for yoga, Qui Gong and therapy- or healing sessions. Dreamflute Dorothée Fröller:: composer, tuning forks, flutes, Tibetan Bowls, keyboards, arrangement.